SAN DIEGO, CA--(Marketwired - Oct 9, 2015) - The Delphi Academy, a San Francisco Bay area school, is the most recent recipient of a $5,000 Barona Education Grant. Located in Campbell in the heart of Silicon Valley, Delphi Academy is an independent, coeducational K-8 school that focuses on basic core subjects while offering a challenging curriculum. The grant, which was sponsored by Assemblyman Evan Low, will be used to purchase 11 Lenovo laptops to help students study purposefully and independently. 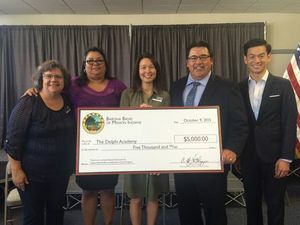 "The Barona Tribe is proud to make a difference for schools throughout the state of California," said Clifford LaChappa, Chairman of the Barona Band of Mission Indians. "By awarding the Delphi Academy with this grant today, we're giving the school's educators the additional tools they need to fulfill their mission in creating competent leaders of tomorrow."